May 13, 2018 at 12:10a.m. Nicholas Cardelli’s second goal of the game helped the Youngstown Phantoms steal home-ice advantage away from the Fargo Force. Six-and-and-half minutes into overtime, Cardelli beat Force goaltender Strauss Mann to give the Phantoms Saturday’s 3-2 victory at Scheels Arena and a split for the weekend. Friday, Fargo won, 4-1, in Game 1 of the USHL’s best-of-five Clark Cup Final. Games 3 and 4 will be played on Friday and Saturday at the Covelli Centre in the Phantoms’ first Clark Cup Final in nine seasons. The Force forced overtime when Griffin Loughran scored his sixth goal of the playoffs with 52 seconds remaining in regulation. Grant Hebert assisted on the goal. 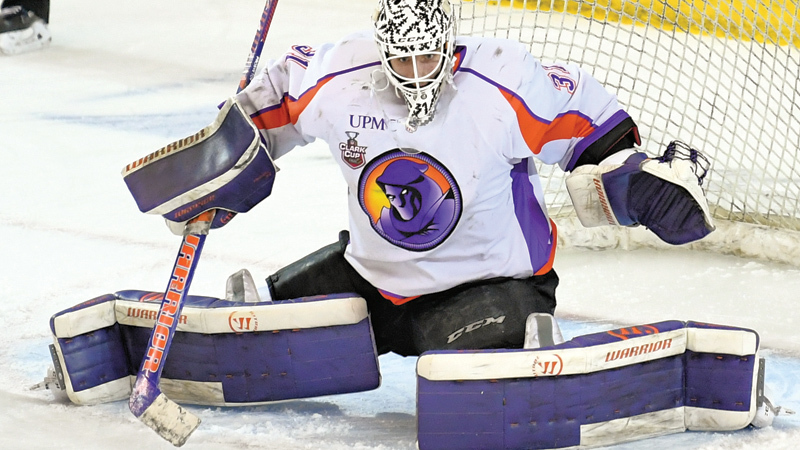 Phantoms goaltender Ivan Prosvetov stopped Fargo’s two shots in overtime to finish with 36 saves. His playoff record improved to 7-2. The Phantoms fired six shots at Mann in overtime. After a scoreless first period, Fargo’s John Schuldt scored an even-strength goal with 15:36 remaining in the second period. Jacob Schmidt-Svejstrup assisted. The lead lasted fewer than four minutes. After Fargo’s Evan Bell was whistled for slashing, Cardelli tied the game with his first goal of the playoffs. Max Ellis and Eric Esposito assisted. With 4:30 remaining in the middle period, Esposito scored his fourth of the postseason with an assist from Cardelli. The Phantoms foiled all seven Force power plays. May 12, 2018 11:13 p.m.